Don't let Mother Nature stop you! 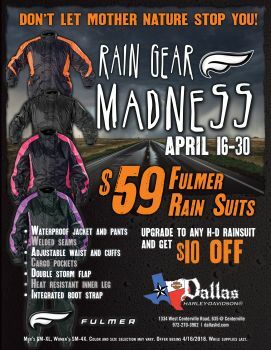 Now during our Rain Gear Madness Sale get Fulmer Rain Suits for only $59! Upgrade to any H-D® Rain Suit and save $10. *Men's SM-XL, Women's SM-4X. Color and size selection may vary. Offer valid 4/16-4/30/18. While supplies last.